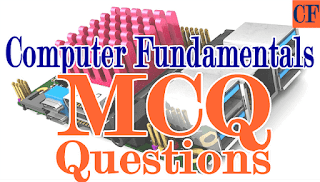 Learn and practice with following computer fundamentals MCQ collection. We present the first 50 multiple choice questions in this set. Each question is with four possible options and there is one and only one correct answer for each question. Computer fundamentals cover the topics such as the history of computers, classification of computers, computer generation, computer system, hardware and software concepts, computer networking, system development life cycle, computers and its impact to the society, computer security, viruses and its remedy and so on. 5. What is the main difference between a mainframe and a supercomputer? D) Supercomputers are focused to execute as many programs as possible while mainframe uses its power to execute few programs as fast as possible. 6. ASCII and EBCDIC are the popular character coding systems. What does EBCDIC stand for? 12. Integrated Circuits (ICs) are related to which generation of computers? 15. Which type of computers uses the 8-bit code called EBCDIC? 19. What are the stages in the compilation process? 20. Which of the following IC was used in the third generation of computers? 25. Which of the following was a special purpose computer? 26. What was the computer invented by Atanasoff and Clifford? 27. Which of the following storage devices can store the maximum amount of data? 28. Which computer was considered the first electronic computer until 1973 when the court invalidated the patent? 32. Which of the following is not an input device? 34. In most of the IBM PCs, the CPU, the device drivers, memory, expansion slots, and active components are mounted on a single board. What is the name of the board? 35. In most IBM PCs, the CPU, the device drives, memory expansion slots, and active components are mounted on a single board. What is the name of this board? 38. Regarding a VDU, Which statement is more correct? 40. When was vacuum tube invented? 41. Which of the following produces the best quality graphics reproduction? 44. Which of the following is not processing? 47. Today's computer giant IBM was earlier known by a different name which was changed in 1924. What was that name? B) Computing Tabulating Recording Co.
48. Before a disk drive can access any sector record, a computer program has to provide the record's disk address. What information does this address specify? 50. What is the responsibility of the logical unit in the CPU of a computer? Correct answers are marked with blue background and explanation is given at the bottom of each question. Explanation: Computer performs processing and storage. Processing is to perform an arithmetic operation, logical operation and comparing (relational operations). Thus option 'D' All of the above is correct. A computer's memory, also known as the Random Access Memory, is a type of chip that is used to temporarily store the programs that are most used. Another type of computer chip is the microprocessor. Microprocessors, also called microchips, are the engines that drive computers. It is where each of the functions that are performed by the Central Processing Unit is incorporated. In fact, the word microprocessor and CPU are often used interchangeably. Another type of computer chip is the GPU. GPUs are what enable images and other graphics to be rendered and displayed. A computer's Graphics Processing Unit is what gives it multimedia functionalities. Among the given options in question option 'B' Primary memory chip and option 'C' Microprocessor chip, both are correct. Thus option D Both b and c is the correct answer to this question. Explanation: Microprocessors are used to build microcomputers and microcomputers (desktops, laptops, and palmtops) are fourth generation computers. Thus, option 'D' is the correct answer. Explanation: The primary purpose of mainframe computers is to support as many users while of the supercomputer is to execute as fast as possible. Thus option 'C' is the correct answer. This is an analogy. The brain performs processing, storing and controlling. CPU has subunits to perform these tasks such as ALU to perform processing, MU to perform storing and CU to perform control. Thus the brain of any computer system is CPU. All of those factors affect the storage capacity. If you can create more tracks per inch or can accommodate more bits per inch of track. The question asks kinds of main memory and the types are ROM and RAM. Options A and B are the types of memory not of main memory. In computer science, a data buffer (or just buffer ) is a region of a physical memory storage used to temporarily store data while it is being moved from one place to another. Accuracy is due to correctness; reliability is due to consistency; diligence is due to be able to work repetition tasks, versatility is due to be able to work diverse kind of tasks. Free from tiresome and boardroom is diligence. integrated circuits or ICs are related to 3rd generation of computers. In first generation vacuum tubes where used, transistors where are used in 2nd generation and in the 4th generation large scale and very large scale integrated circuits where used. CD Rom is an optical storage device. It is not semiconductor memory neither register nor the magnetic memory. hybrid computer is a combination of analogue computer and digital computer. You can receive the analogue signals and process as well as you can process the digital data. So it resembles both with the analogue and digital . extended binary coded decimal interchange code is a binary code that IBM for its larger operating systems. It was used in systems like S/390 servers. IBM's PC and workstation operating systems do not use IBM's proprietary EBCDIC. Instead they used the industry standard code for text as ASCII. 34. In most of the IBM PCs, the CPU, the device drivers, memory, expansion slots and active components are mounted on a single board. What is the name of the board? 35. In most IBM PCs, the CPU, the device drives, memory expansion slots and active components are mounted on a single board. What is the name of this board?